He then had that heretical priest hung. Shortly afterwards, the Pope was killed when a piece of poorly built ceiling – obeying the laws of gravity – fell on him while he slept. Four hundred years later, despite considerable progress unraveling the mysteries of the physical world, religion in the Late Middle Ages still defined people’s lives. 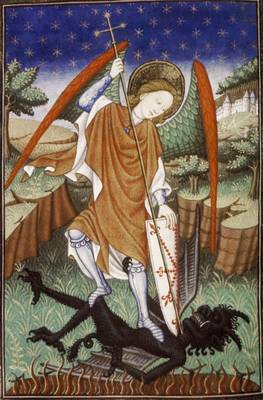 Triumphant clergy after a successful demon-busting session and a devilish artist. Most common people in the Middle Ages didn’t go to the doctor when they were sick. For one thing, they couldn’t afford to. For another, they attributed their afflictions to sinful behaviour that had incurred God’s wrath. So they prayed for God’s mercy. Sometimes it worked. Often, it didn’t. 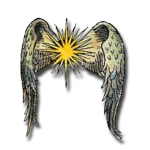 In The Infidel’s Garden, Yolente, who would these days be diagnosed as an alcoholic, blamed her illness and misfortunes on all manner of evil forces, including her infidel servant Marjit. As was common among the well-to-do, she also paid pilgrims to travel to the Holy Land with special prayers to cure her of what would eventually become cirrhosis of the liver. I’m sure the pilgrims did a roaring trade. Not sure though, if it helped with people’s problems. It certainly didn’t help Yolente. 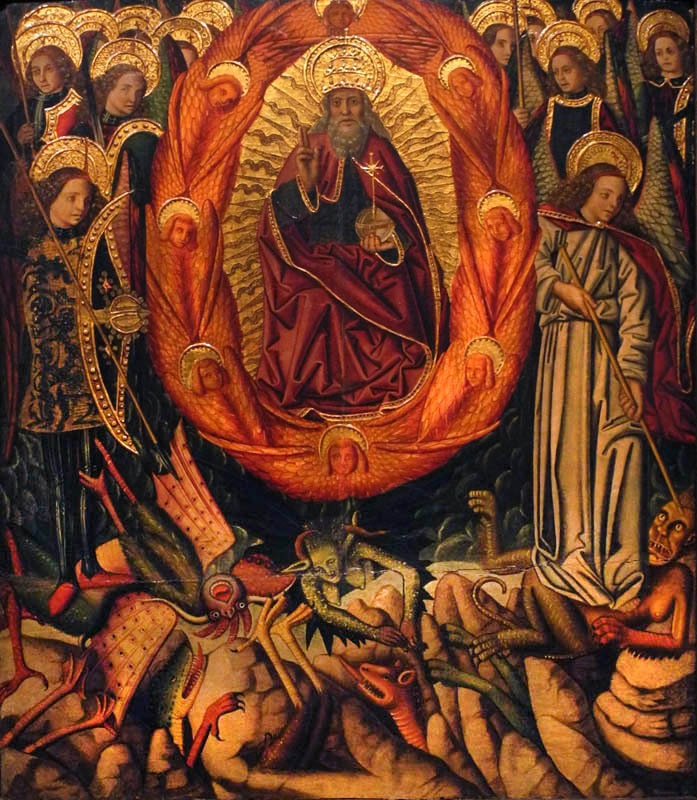 Some of the forces tempting Christians in the Late Middle Ages. While Christianity still clung to literal interpretations of Biblical texts, Islamic thought had segued more into a more abstract view of the world. With a more rational and less superstitious approach to the whole conundrum of existence, Islam tried to make sense of the natural world through study of rainbows, the chemistry of plants, medicine, and development of mathematical principles. Marjit, thanks to her Sufi upbringing, arrived in Hertogenbosch with a more reasoned approach to faith and struggled to accept many of the backward Christian doctrines she encountered. Ah! How I ache to say a thousand things then! 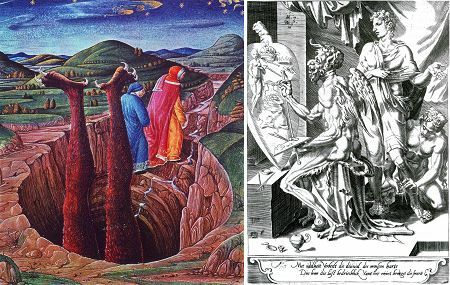 I want to point out that before Islam the world had descended into a dark and superstitious age (yes, even worse than this age) which the teachings of the prophet Muhammad dispelled. I want to point out to that fool of a woman that the Arab world gave the West knowledge and many gifts including the water clock, algebra and the artichoke. Yet the Church, supported by a Monarchy wanting to maintain power, had a vested interest in perpetuating Christianity’s more backward beliefs, doctrines and traditions. Including the belief that humankind’s problems could all be traced back to Eve and that apple. 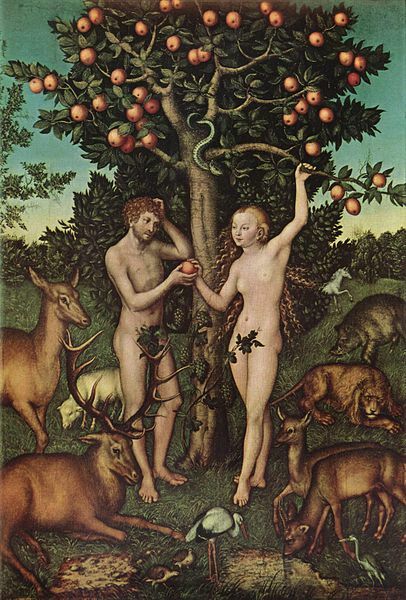 According to Christianity, Eve and that damned apple ruined everything. Thanks to all this ideological skulduggery, many clergy lost touch with the core values of the faith they professed to follow. Only the Church could save wayward Christians from damnation. The pressures to conform during this period of history must have been enormous for the good people in positions of responsibility who wished to remain true to Christianity’s core values. Which is why Mother Geertruyt always looked so tired. And why Brother Regiomantus was hung. 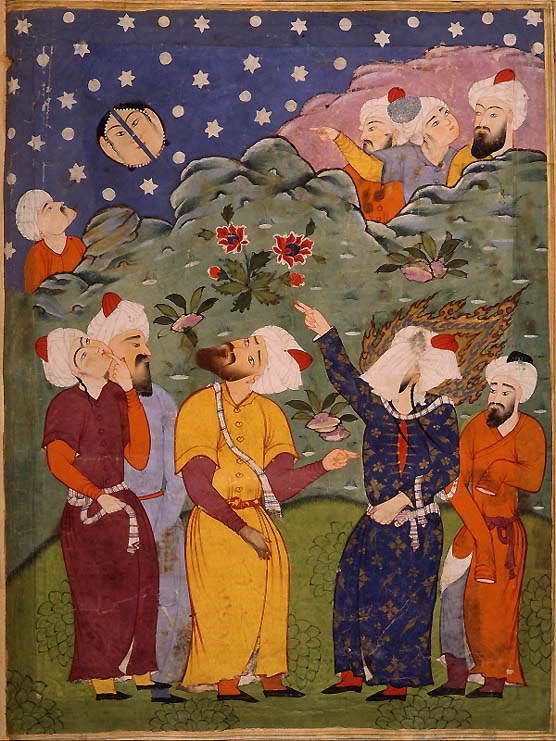 A veiled Muhammad splits the moon. Which is why, back in Vertientes, the tolerant and more open minded Mullah Fiazan always looked tired as well.